Oil and gas production from the Bakken Shale is projected to use up to 5.5 billion gallons of water annually for as many as two decades. North Dakota is in the midst of a hydrocarbon production boom, as gas and oil developers tap the Bakken Shale. But the boom also is generating civic resistance in the arid region because it requires significant quantities of fresh water. Lynn Helms, 53, spent the first 20 years of his career as a roughneck and petroleum engineer, and the last 12 in North Dakota’s state government, most recently as director of the Department of Mineral Resources. Helms, in short, knows a hydrocarbon development boom when he sees one. 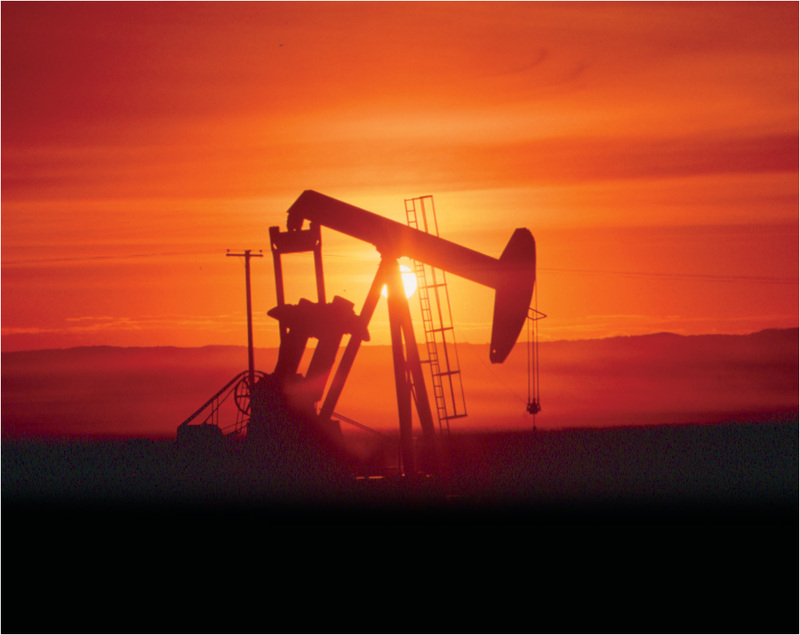 This year, if production continues to rise as steadily as it has since 2007, North Dakota will produce more than 100 million barrels of oil—tripling its 2004 production. Only Texas, Alaska and California produce more. Three years ago, North Dakota barely made the top ten. The state this year will also produce about 100 billion cubic feet of natural gas, putting it 19th among states. “We’ve taken a great leap forward,” Helms told Circle of Blue when describing North Dakota’s new hydrocarbon development era. The source of Helms’ enthusiasm is the Bakken Shale, which lies 10,000 feet below North Dakota, as well as parts of Montana and Saskatchewan. And beneath the Bakken is another oil-rich formation called the Three Forks that shows promise as a big oil producer. Just one in 100 wells drilled into the Bakken Shale fail to yield marketable quantities of oil or gas, according to industry executives. Oil wells in the formation are capable of producing 4,000 barrels a day or more, state figures show. But shale oil production is also leading to a tight choke point caused by rising oil and gas production, as well as diminishing supplies of fresh water in one of the most arid regions of the United States. Developing a barrel of oil from the Great Plains’ shale reserves requires at least four barrels of fresh water, while a barrel of conventional oil requires about one barrel of water. Producing oil and gas from the Bakken formation is projected to use up to 5.5 billion gallons of water annually for as many as two decades, according to the Bismarck Tribune. In Dunn County alone, which already produces 1.1 million barrels of oil a month, the demand for water is expected to increase to one billion gallons a year. 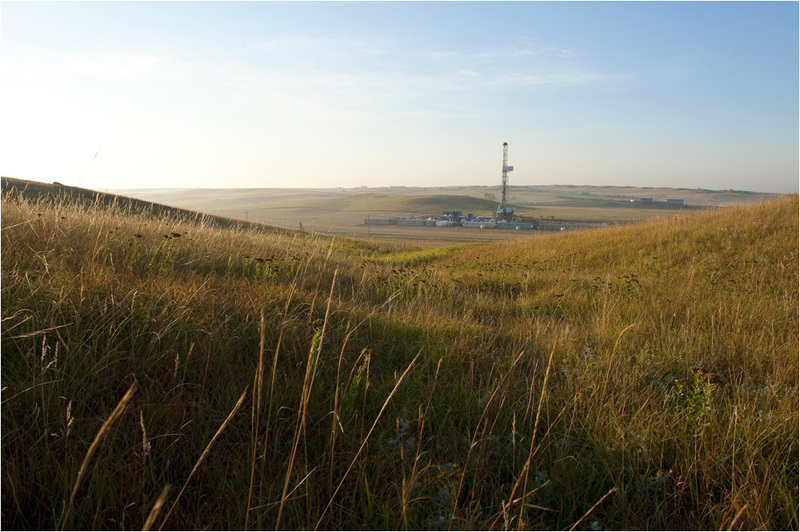 Unlike “conventional” reserves of oil and gas that exist in deep pools and can be sucked out with standard, straw-like wells, tapping the “unconventional” Bakken Shale requires rupturing the rock to open spaces through which oil and gas can flow. This pulverizing process, called hydraulic fracturing or “fracking,” involves sinking drill bits two miles deep, then turning them to move horizontally through the shale. An armada of tank trucks haul two million to four million gallons of water to each well site, where pumps shoot it down the well at such super high pressure—8,000 pounds per square inch—that the rock splits. Helms, like other officials overseeing the North Dakota development, is well aware of the new contest between oil and water. But he doesn’t dwell on the risk of the state’s oil and gas express. At the end of 2009, state and industry officials discussed a possible water pipeline project because aquifer allocations were running out months ahead of schedule. This issue could worsen as oil production increases. Just one day before Helms’ appearance in Minot, an oil well undergoing fracking near Kildeer ruptured. The blowout leaked 100,000 gallons of fracturing fluid and crude oil before being plugged two days later. A plastic barrier, cement pad and protective dike confined the leaked fluids to the well site, preventing it from reaching a nearby creek. Tests of nearby water wells found no evidence of contamination, according to the Associated Press. Monitoring wells will continue testing the groundwater for at least two months. Bob Cornelius, vice president of operations for Denbury Resources Inc., the developer, told Circle of Blue that the rupture occurred in the steel and concrete casing inside the wellbore during hydraulic fracturing operations. “The preliminary diagnostic information suggests that the 7-inch casing failed right below the wellhead,” he said. An ongoing state investigation into the blowout is examining a shutoff in the fracturing equipment that raised pressure within the wellbore beyond the casing’s threshold, Helms said. The investigation has determined that the wellbore failure occurred close to the surface, with further study slated to determine whether any damage was done lower in the wellbore that could leak fluid into the aquifer. While Helms could not discuss the specific case because of the ongoing investigation, he said that a well operator following state regulations should not have had a blowout like the one that occurred in Killdeer. Earlier this year, the volumes of water needed to frack the Bakken Shale also generated concern among state fisheries and wildlife officials. In February, a supervisor with the North Dakota Game and Fish Department formally opposed a farmer’s plan to sell one-third of the water from the eight-foot-deep Trenton Lake to a Texas energy developer. In February a western North Dakota man faced criminal charges for illegally selling 23 million gallons of water to the oil industry, the Bismarck Tribune reported. William Pavlenko of rural Dunn County, who operates a water depot west of Killdeer, had a permit to sell 26 million gallons of water in 2009. But Pavlenko sold nearly twice as much before state regulators caught on. The State Water Commission uncovered the discrepancy in the fall of 2009, after checking water meters amid reports that other Killdeer Aquifer allocations were running out months before the end of the year. Oil and gas developers could gain access to an additional 19.6 billion gallons of water if the 32 groundwater and 11 other surface water withdrawal applications currently being reviewed are approved. Farmers who rely on groundwater for their livestock and irrigation have also expressed concern about the sharp rise in oil industry applications to establish new water wells for production. From 1980 to 2007, North Dakota issued 10 permits to develop what the state calls “water depots,” according to the Office of the State Engineer. Since 2007 North Dakota has issued 35 water permits, 32 of them to establish large ground water wells and three for surface water withdrawals. Together, the wells are capable of producing nearly 4,000 acre-feet of water annually, or 1.3 billion gallons. Helms told Circle of Blue that “we’ve got a couple of aquifer systems that are used, but the State Water Commission has been very judicious in the amount of water that they allow to be extracted from those.” The water commission, though, isn’t as sanguine. It started limiting the groundwater in Killdeer that could be sold for industrial uses like hydraulic fracturing earlier this year after the Killdeer Aquifer was three feet lower than its 2000 level despite recent rains. The state is reviewing applications for 32 more groundwater wells and 11 others for surface water withdrawals. If all are granted, oil and gas industry developers will have access to 19.6 billion gallons more. Long-term local residents question the consequences. Melvin and Morrene Wisdahl live in Corinth, a dying town on the prairie 50 miles north of Williston. They’ve seen the oil rigs crop up closer to their farm each year and watched the constant steam of 8,000-gallon tanker trucks carrying water to the well sites. One thing the Wisdahls have always been able to count on is the water, and they worry that the demand from the oil and gas industry could change that. Tapping into 4.3 billion barrels of recoverable oil in North Dakota will be costly to Great Plains water supplies. Projections assert that producing oil and gas from the Bakken Shale formation will use up to 5.5 billion gallons of water annually for more than two decades. Helms indicated North Dakota has no intention of slowing the spread of oil wells or reducing the demand for water. In 2008, the U.S. Geological Survey estimated that as many as 4.3 billion barrels of oil may be recoverable from the Bakken formation. The estimate—25 times larger than a similar assessment released in 1995—was larger than any other estimated oil reserves in the lower 48 states and was “the largest ‘continuous’ oil accumulation ever assessed by the USGS,” the agency said. 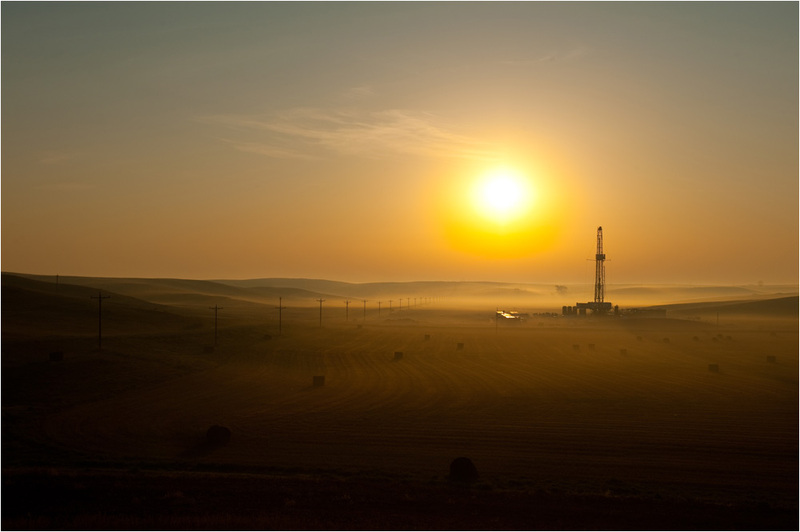 Industry executives and engineers estimate that recoverable reserves in the Bakken Shale could be many times higher. Whatever the case, Bakken development, along with deep water oil production in the Gulf of Mexico already is helping to increase domestic U.S. oil production to more than five million barrels per day, the first time it has grown since the 1970s, when domestic production peaked at more than 10 million barrels per day. 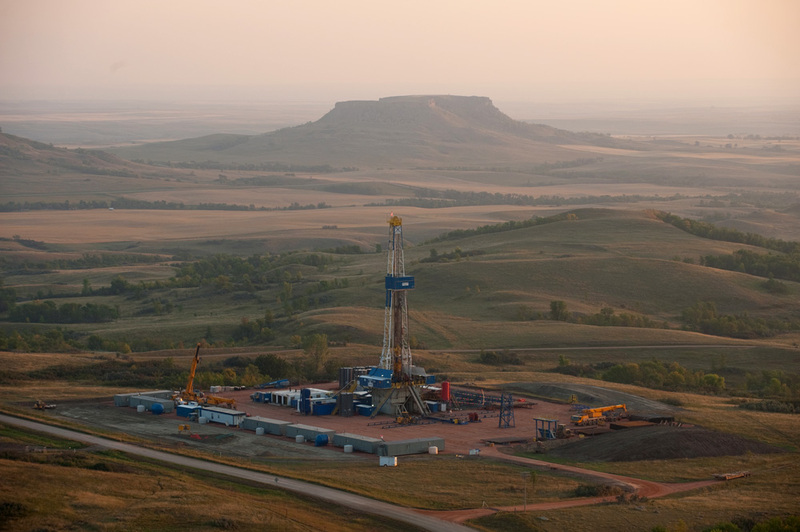 The North Dakota oil shale boom is also prompting new leasing activity in the Niobrara Shale in Wyoming and Colorado, where the first wells are being developed in similarly deep carbon-rich shales. The United States has known for years that its shale reserves contain trillions of barrels of oil, much of it located in the Rocky Mountain West. But until now, they’ve proven to be too expensive to develop. The North Dakota oil rush is prompting a reappraisal that is altering the economy and landscape of four Great Plains states. By the end of the year there will be more than 5,000 oil wells in North Dakota, almost 1,400 of them Bakken Shale wells developed since 2007. Helms predicted in Minot that by the time the unconventional reserve is fully developed, there will be 21,000 wells sunk into the North Dakota landscape, virtually all them drilled into the oil shale. With well numbers increasing by 70 per month, nearly 1,000 per year, and accelerating, that’s a lot of water. Thousands of laborers have migrated to North Dakota to work in the state’s booming oil and gas industry. Unemployment is 3.6 percent, the nation’s lowest, and state officials reported a budget surplus of $800 million in June. Although North Dakota has one of the largest freshwater lakes in the country, Lake Sakakawea, which was created behind a dam built in the 1940s on the Missouri River, the U.S. Army Corps of Engineers has been reluctant to approve withdrawal permits until they have completed a new study of the lake’s capacity. In the meantime, in the dry plains water is scarce enough for the state to consider using water recycled from sewers and wastewater treatment plants to frack oil and gas wells. “What we’re working on right now is some cooperation between the industry and the cities, for you to get out of the business of discharging your final treated water and pick it up in trucks and haul it out and use it for frack water,” Helms said in Minot. It’s not often that North Dakota is the center of national attention. But the cyclone of energy production in the state’s northern and western reaches is hard to ignore. Almost 150 oil and gas drilling rigs are operating in North Dakota this month, nearly tying a state record. Thousands of oil field trucks jam remote high plains highways that not long ago were so empty people could virtually picnic on the centerlines. More than 7,000 laborers from other states have migrated to North Dakota’s oil and gas fields, according to the state Job Service, and the state unemployment rate has dropped to 3.6 percent—the nation’s lowest. When North Dakota’s budget cycle ended in June, Budget Director Pam Sharp reported an $800 million surplus. Not too many in North Dakota’s state government are really worrying, yet, about the water supply. Steve Kellman is a Circle of Blue reporter based in Traverse City, Michigan. Keith Schneider is Circle of Blue’s senior editor. Reach them at circleofblue.org/contact or contact Keith Schneider directly. Graphic created by Ball State University graduate student, Daniel Cooper, with data compiled by Circle of Blue’s Aubrey Parker, Andrea Hart, Steve Kellman and Keith Schneider. Will there be sufficient water available from the Souris River and wells for the drilling anticipated in Bottineau County in 2012? at this point there is no shrortage of water in north dakota in certain areas. north of williston and east of wiliston are some very strong aquifers that are currently in heavy use for irrigation and industrial water. these aquifers are strong and are in no danger. additionally the Missouri and Yellowstone Rivers flow plenty of water in north dakota to handle the industrial uses. enough water flows by the bridge at williston in 100 minutes to frack every well drilled in the state for a year. not all area in north dakota are in a water crunch. After the oil rigs are gone, and the profits have been made (and are sitting someone elses pockets), the people of N.D. will be left with the consequences of depleted and poluted aquifers. Would you mind citing the source for your assertions? Full disclosure: I’m very skeptical of the “everything’s fine here, keep moving” attitude. to bring in salt water? This would be good because I don’t think they will empty the ocean. ND state government has put ND up for sale! Many lies in these comment. There has been areas where there was danger of depletion. That is why they are pulling from Lake Sakakawea now. The oil industry is not “producing” oil and gas, they are extracting it from the Bakken Shale. Using the words “producing” and “production” is very misleading, as it sounds like they are growing or manufacturing it. Extraction is also a good word for taking water from aquifers. These companies really need to be more careful about this as the consequences for leaks or damages can be catastrophic to the environment and the public.